God is creating a family, but He is particular as to whom He will accept as members. What does it mean to have the fear of the Lord but to not be fearful? In the book of Revelation there is a list of the types of people that God will not accept as part of His family. That list includes “the cowardly [fearful in the King James Version], unbelieving, abominable, murderers, sexually immoral, sorcerers, idolaters, and all liars” (Revelation 21:8). It may seem perplexing or perhaps unusual to find that those who are fearful, or cowardly, are listed along with murderers! Yet we know that God is righteous, therefore, there has to be a logical explanation for this. One of the natural tendencies that humans have is fear, although some people experience it more than others. In fact, some people may have a fear of one thing while others may have a fear of something totally different. Fear can be good or bad. For instance, if we have a fear of heights and we have to climb a ladder or get on the roof of a building, it can cause us to be more cautious than we might otherwise be. The same is true for those who have a fear of water; it causes them to be more alert to the danger of drowning. These types of common fears will not keep anyone from becoming a member of God’s family. If having any kind of fear could keep us from becoming a member of the family of God, then we might all need to have the courage to bungee jump off a high bridge or walk on the wing of an airplane while it’s in flight! But conquering those natural (and beneficial) fears is not what God cares about. In fact, the Bible tells us there is a fear we need to have. 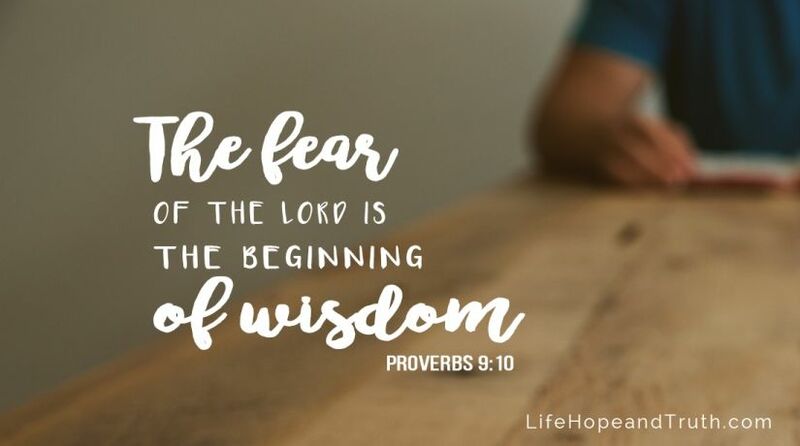 It is described in Proverbs 9:10: “The fear of the LORD is the beginning of wisdom.” This kind of wisdom is godly wisdom, not the kind of wisdom this world has to offer. Another verse that describes this fear is found in Proverbs 8:13: “The fear of the LORD is to hate evil.” God hates evil and will not allow those who practice it to be in His family. So, again, to fear the Lord is a good type of fear. It is a fear that will bring us closer to God. A third example is found in Proverbs 14:27: “The fear of the LORD is a fountain of life, to turn one away from the snares of death.” The Bible tells us, “The wages of sin is death, but the gift of God is eternal life” (Romans 6:23). So having the fear of the Lord will help keep us from the snares of sin that lead to death. But there is a type of fear God tells us to avoid. A motivational speaker once told a story about seeing a bird that appeared to be frozen. Upon further examination, he discovered that the bird was looking at a snake that was watching it. After a few minutes the speaker picked up a small stone and tossed it toward the snake in order to distract it, and immediately the bird flew away. The point that he was making was that the bird could have flown away at any time. But because of its extreme fear of the snake, the bird became paralyzed. This is the kind of fear that can keep us from following Christ, and thus keep us from becoming a member of God’s family and part of His coming Kingdom. This is a fear so strong that it immobilizes us from following Christ and keeping God’s laws. When God opens our minds and gives us understanding of His ways and laws, we may find that we have practiced many religious customs that are not taught in the Bible, and that the Bible teaches things we have not understood. It takes courage to act on this knowledge. For example, to suddenly start observing the Sabbath and holy days could cost a person his or her job or alienate the person from his or her family. These kinds of situations can cause extreme stress and the kind of fear that can cause us to back away from obeying God. In the parable of the talents in Matthew 25 the servant who was “afraid” to invest his resources was condemned for being “wicked and lazy” (verses 25-26). A lesson from the parable is that fear can be an excuse for not making the effort to obey or overcome (Proverbs 26:13). This is the kind of fear that is condemned in Revelation 21:8. It can be a paralyzing fear, but we must remember that we can do all things through Christ who strengthens us (Philippians 4:13). God promises that those who overcome sin will inherit all things (Revelation 21:7). But to overcome requires that we not allow ourselves to become restrained by fear. God promises us that He will never leave or forsake us (Hebrews 13:5). Therefore, we must trust God and have the courage to step out on faith. Our ability to step out on faith and overcome sin depends upon how strong our love for God is. Jesus told us that to love God with all our heart, all our soul and all our mind is the first and great commandment (Matthew 22:37-38). This requires that we put God first in our life. To emphasize that God is to be first, Jesus stated, “If anyone comes to Me and does not hate his father and mother, wife and children, brothers and sisters, yes, and his own life also, he cannot be My disciple” (Luke 14:26). It should be noted, however, that the word hate is better understood as, “to love less by comparison.” In other words, we are to love Christ even more than we love our own family! Jesus continued, “And whoever does not bear his cross and come after Me cannot be My disciple” (verse 27). Therefore, we must be willing to sacrifice our job and even relationships, if necessary, to follow Christ and to be obedient to the laws of God. God is to be first in our life. God is love. The Scriptures tell us that we love God because He first loved us. By keeping His Word, the love of God is perfected in us (1 John 2:5). As Jesus Himself stated, “It is written, ‘Man shall not live by bread alone, but by every word that proceeds from the mouth of God’” (Matthew 4:4). It is important that we establish the Word of God as foundational in our lives. The night before Jesus’ crucifixion, He was taken captive and interrogated by the Sanhedrin. After questioning Jesus, the Sanhedrin accused Him of committing blasphemy and judged Him to be worthy of death. Then some began to spit on Him, blindfolded and beat Him, while asking Him to prophesy who it was that hit Him. Peter was sitting outside in the courtyard, having witnessed what happened to Jesus. He was approached by a servant who said, “You also were with Jesus of Galilee” (Matthew 26:69). But Peter denied it! Three times Peter was accused of knowing and being with Jesus, and all three times Peter denied it. In fact, the third time “he began to curse and swear, saying, ‘I do not know the Man’” (verse 74). Obviously, Peter was overcome with extreme anxiety to the extent that he feared for his life. But he learned his lesson and wept bitterly (verse 75). After Jesus’ death and resurrection, He appeared several times to His disciples. On one of those occasions, Jesus asked Peter, “Simon, son of Jonah, do you love Me?” Three times Jesus asked Peter this question (John 21:15-17). Peter had earlier denied Christ three times. And so Jesus asked Peter this pointed question, “Do you love Me?” three times. And after each time, Peter responded by saying “Yes Lord; You know that I love You.” But Peter got the point; Jesus wanted Peter to truly love Him in a much deeper way. Peter needed to learn to love in the selfless, godly way Jesus demonstrated. It is obvious that over the years and through his trials Peter did strengthen his love for Christ, and he became one of the great apostles who preached the gospel without fear (see 1 Peter 3:13-18). As the writings of the apostle Paul also attest, preaching the gospel in the first century was not for those who were fearful or cowardly (2 Timothy 4:16-18). As individuals, we probably have many goals in life, but our main goal should be to become a member of the family of God. To achieve this goal, we must overcome the obstacles that we encounter in this life. And to do this requires that we overcome any fears that would hinder us from obeying God or putting Him first in our life. Therefore, we need to love God with all our heart, all our soul and all our mind. As the apostle John reminded us, “There is no fear in love; but perfect love casts out fear” (1 John 4:18).